This is a conservatively managed business, with an average loan-to-property value of 62% and 2.3 times debt to equity leverage. Income is the interest earned from the mortgage portfolio minus the cost of the debt. The portfolio is 95% floating rate loans, with debt rate matched to each loan. 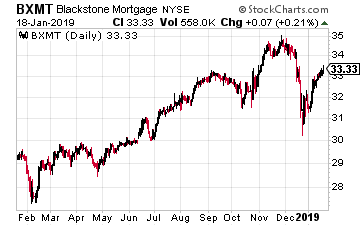 The result is that as interest rates increase, so will Blackstone’s profits. Corporate Profits will be Stronger. The decrease in business regulations from the Federal Government and the corporate income tax rate reduction were strong tailwinds for business results in 2018. And the effect will continue into 2019. Hotels are a business sector where profits fluctuate with economic and business activity. After three years of flat profit margins, hotel owners could see profits move dramatically higher in 2019. Hotel/lodging REITs own hotel properties that are managed by third party companies. These REITs do participate in revenue increases. The hotel REIT shares pay attractive yields with the potential for significant dividend increases in 2018. 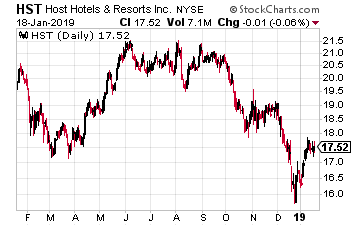 Host Hotels and Resorts Inc (NYSE: HST) is the largest lodging REITs with a $13 billion market cap. The company owns a diversified portfolio of 94 premium hotels with over 54,000 rooms. These include upscale central business district locations, resort locations, and prime airport lodging facilities. Third party management contracts are with Marriott, Sheraton, Hyatt, Hilton and other premium hotel operators. For the first three quarters of 2018, the company generated adjusted FF0 of $1.34 per shares, with full year guidance of $1.75 per share. 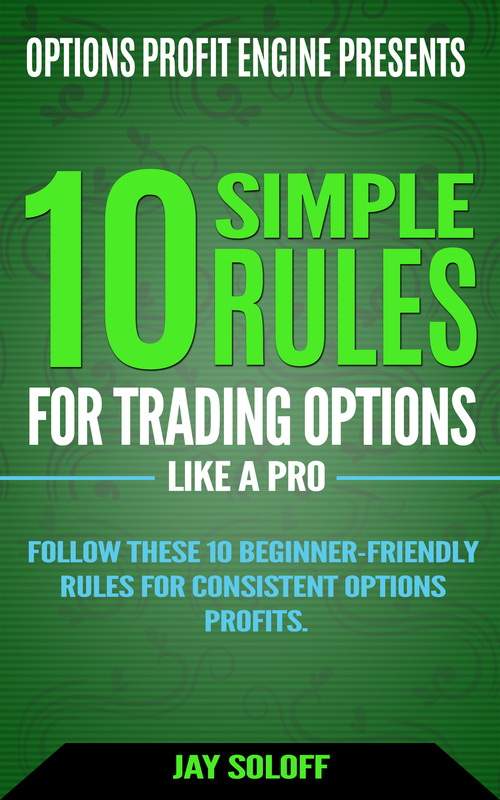 The annual dividend rate is $0.80 per share. FFO per share was up 5% compared to 2017 and the dividend stayed level. Host Hotels did declare an additional $0.05 per share dividend in December. Third quarter 2018 RevPAR was up 1.6% compared to Q3 2018. This number is a good indication of how lodging revenues and profits have been very flat. A shift to increasing RevPAR will allow the company to grow the dividend and propel the share price higher. Full year 2018 results come out on February 20. Ecommerce sales will continue to grow. Continued growth in ecommerce is one trend from 2018 and earlier years that will continue into 2019. Amazon is the 800 lb. gorilla in ecommerce but operates on a business model that puts sales growth over profits. This is a stock that has a P/E of 62, and a share price held up by investor faith. If investors start to doubt the Amazon model, the share price could crater, badly. However, a big drop in the Amazon share price won’t stop the double digit annual growth in ecommerce sales. The profitable winners from this growth are warehouse owners. One study shows that ecommerce fulfillment requires three times the warehouse space compared to traditional brick-and-mortar retail operations. 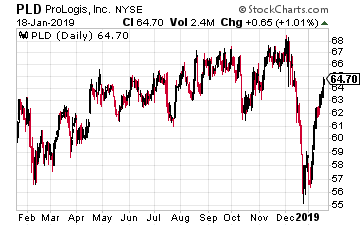 Prologis, Inc. (NYSE: PLD), with a $40 billion market cap, is a global logistics giant. The company owns or partially owns properties and development projects across 771 million square feet in 19 countries spanning four continents. The Prologis portfolio is concentrated in population centers where consumption and supply chain reconfiguration (to better serve ecommerce fulfillment) drive logistics demand. Despite the recent pullback in REIT values, Industrial/warehouse REITs continue to be of the hot REIT sectors. Industrial/warehouse properties in prime urban and transport hub locations have very high barriers to new competition, and vacancy rates are at all-time lows. There is plenty of potential for Prologis to increase rental rates. The company has increased its dividend by an average 11% per year over the last five years. I forecast continued double digit annual dividend growth.